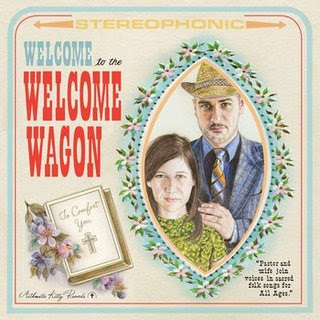 Welcome to the Welcome Wagon! What an aptly titled debut from the Presbyterian 2-pack of The Rev. Vito Aiuto and his wife Monique, who proselitize religious music haters like me due to the duets faithful, yet good-humored folk-gospel born out of the living room sing-along tradition. In addition to indie "sacred" hymns, and psalms you'll discover the pair have read their music bibles, with coverage of The Velvet Underground's "Jesus" in addition to The Smiths "Half A Person." The record also happens to have the thumbprint of one of their brooklyn neighbors/ Asthmatic Kitty label head/One of my favorite artists of all time, Sufjan Stevens, who recorded, produced and arranged for the record. This can best be heard on our featured "Sold! To the Nice Rich Man", with the usual Sufjany orchestral manouvres of showy guitar riffs and piano codas, chock-full of glockenspiel, a rowdy chorus, and an imposing flourish of brass instruments like wartime canons. In case you Sufjan fans are wondering, Stevens' "Vito's Ordination Song" is named after this very Vito's spiritual conversion at the age of 20. Although they've already turned some heads, it's never too late to jump on this band's wagon...whah whah whah! Five Four Warehouse Sale this weekend! Jini's Pick of the Week - Karoshi Bros.